In June I called Kahala the merger arbitrage idea of the year, but of course when you call something the idea of the year in June you risk that something better comes along later on. Kahala proved to live up to it’s expectation: I got cashed out at $159.82/share while I entered my position at $139.07: a return of 14.9% in less than two months time. Pretty awesome, but the deal presented by Glacier Water Services (OTC:GWSV) might even be better. The company is being bought by Primo Water (NASDQ:PRMW) for a mix of cash, stock and warrants. The exact amounts are not yet known because some adjustments are made for transaction costs incurred by Glacier and any additional debt incurred by Glacier after the date of the merger agreement. These complexities and also the accompanying uncertainties are without a doubt part of the reason of the high spread. In Kahala the merger agreement had similar provisions, and the fact that both stocks are highly illiquid adds another parallel. The first two items are very straightforward, while we have to do a little bit of math the figure out the value of the warrants. The warrants have an expiry date 5 years after the completion of the merger and have a strike at $11.88. With Primo Water trading at $13.05 at the time of writing this, it should be obvious that these warrants are quite valuable. They are already a decent amount in the money, and they also have a huge amount of time value. If we add these variables in an option calculator, and use a volatility of 41.7% (the historical volatility of Primo Water this year), a interest rate of 1.27% (the yield on 5-year US government bonds) and a 0.0% dividend yield a warrant for one share would be worth $5.35. Since Glacier Water is at the time of writing this trading at $22.48 the spread is 17.3 percent! “Closing Cash Consideration” means an amount equal to (A) the Closing Consideration Value multiplied by the Cash Percentage minus (B) the amount of the Transaction Expense Exclusion minus (C) the amount of Transaction Expenses minus (D) the amount of Company Debt (if any). “Closing Stock Consideration” means the number of shares of Purchaser Common Stock determined by (A) calculating an amount equal to (x) the Closing Consideration Value multiplied by the Stock Percentage plus (y) the amount of the Transaction Expense Exclusion, and (B) dividing such amount by the Average Share Price. For purposes of calculating the definition of the Closing Stock Consideration pursuant to this Section 1.6(e)(vi), if inclusion of the Transaction Expense Exclusion in the value of the Closing Stock Consideration would require the Purchaser to obtain stockholder approval of the transactions contemplated by this Agreement pursuant to Nasdaq Marketplace Rule 5635 and such stockholder approval has not been obtained, then the Transaction Expense Exclusion shall be omitted from the definition of Closing Stock Consideration and shall instead be included in the calculation of Closing Cash Consideration as an addition and not a reduction to the calculation thereof. From the $49,932,724 cash consideration the transaction expenses are deducted together with any new net debt. At the moment both parties expect that Glacier will not incur any new net debt, and that the total adjustment for the transaction costs will total $5,600,000. This amount also contains the “Transaction Expense Exclusion” of $1,750,000 which is added back to the stock consideration. So the closing cash consideration will be $44,332,724 ($49,932,724 minus $5,600,000) while the closing stock consideration will be $37,908,180 ($36,158,180 plus $1,750,000). To determine the number of shares that will be delivered to pay this consideration an average share price of $11.88 will be used. The number of warrants that will be delivered is not subject to any adjustments and it’s simply a total of 2 million. Now we only need to know the number of shares that will be outstanding immediately before the merger and we can calculate the value of the various components. The number of shares outstanding at 6 October was 3,316,916. The company expects that Glacier will issue 69,400 bonus shares in connection with the merger, and there are 214,129 minority units outstanding. In addition to this there are 157,438 options outstanding with an average strike price of 15.45. These will be converted into shares based on the value of the stock and the cash component of the merger (the warrants are ignored). The per share merger consideration is roughly $12.13 plus 0.87 * $13.05 = $23.48. Now the number of shares issued for the options can be calculated as follows: (($23.48 – $15.45) / $23.48) * 157,438 = 53,858. 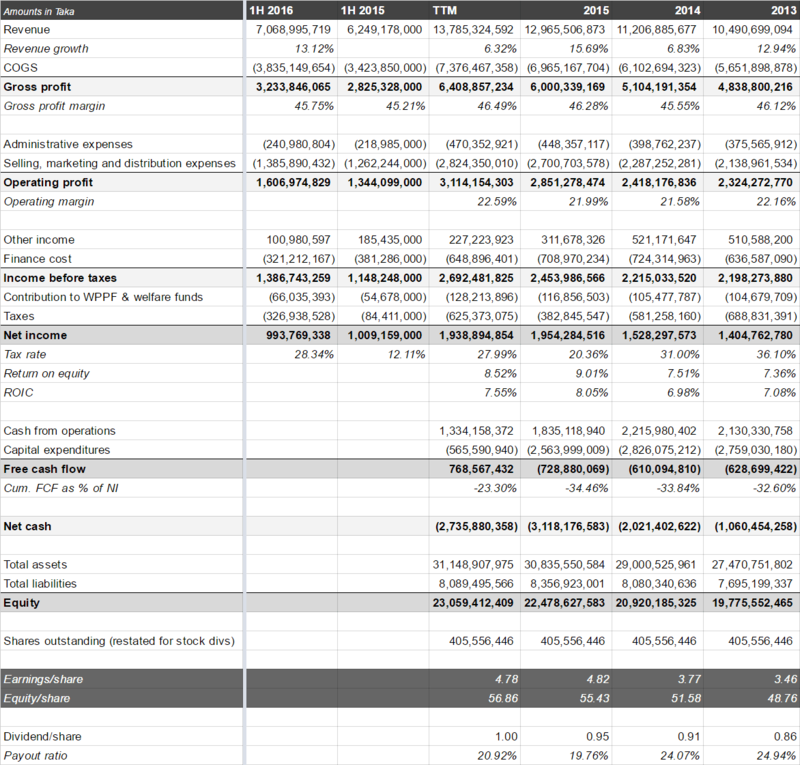 Now we can add everything and we find a total of 3,654,303 shares that will be outstanding before the merger. Divide the closing cash consideration of $44,332,724 by 3,654,303 shares and we get a cash component of $12.13/share, a number of 0.87 shares of PRMW per GWSV share and 0.55 warrants per share. This matches almost perfectly with the estimates provided by the company in the S-4 (as it should), but having done this math we can now also easily check what would happen if the adjustment ends up being lower or higher. If for example the adjustment ends up one million higher we get the same stock/warrant consideration, but just $11.88/share. So every million in additional expenses reduces the return by roughly 1.2%. Since the spread is at the moment roughly 17.3% the adjustment can increase by more than 14 million (a lot!) before the expected return turns negative. 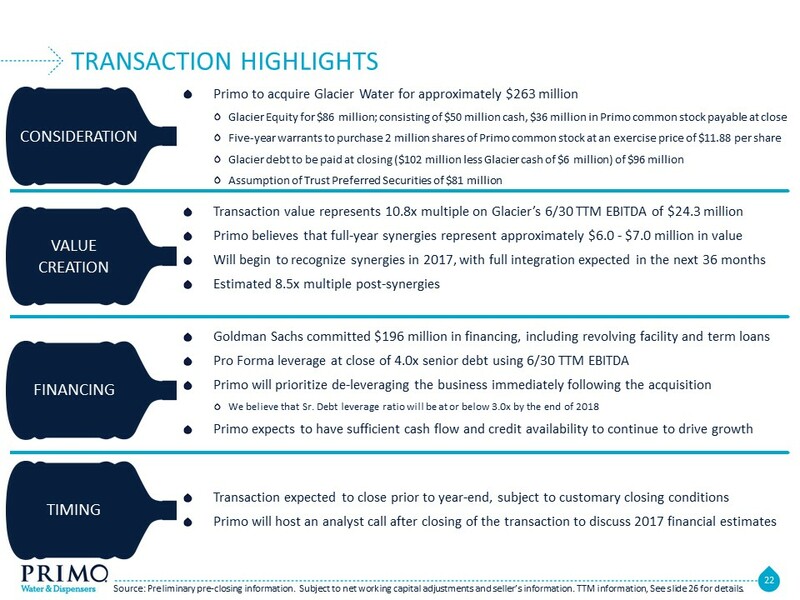 Primo will withhold from Glacier equityholders (on a pro rata basis according to their respective interests therein) and deliver to the escrow agent 71% of the stock consideration payable to each such Glacier equityholder, to be held and distributed by the escrow agent pursuant to the terms of the Merger Agreement and the escrow agreement. Subject to any claims for indemnification, the escrow will be released to the stockholder representative, on behalf of and for distribution to the Glacier equityholders, as follows: twenty-five percent (25%) of the escrow will be released on the date that is six (6) months following the Closing Date; an additional twenty-five percent (25%) will be released on the date that is nine (9) months following the Closing Date, and the remaining fifty percent (50%) will be released on the “Final Escrow Release Date”, which means (i) if the Closing Date is on or prior to December 31, 2016, the date that is the first anniversary of the Closing Date or (ii) if the Closing Date is after December 31, 2016, the date that is thirty (30) days following the completion of an independent audit of Primo and its subsidiaries on a consolidated basis following the Merger for the fiscal year ending December 31, 2017. I don’t think that having a large part of the share based component in escrow represents a big risk factor, although that also could be overly optimistic. You could argue that apparently Primo Water thinks the escrow is required, so that implies that there is some probability that the escrow might indeed be required to pay for some unexpected adjustments. But even if you expect to eventually receive all shares in the end it’s for sure an additional complication since it could take more than one year before the last shares are released. A valuable component of the deal are the warrants because they are already in the money. These also have some complications that make them less interesting for those who want to do a “clean” merger arbitrage. One third of the warrants will vest 180 days after the merger is completed, another third will vest 270 days after the merger is completed and the last batch will vest one year after the completion of the merger. In addition to this the warrants might not become tradable, because in the S-4 it is stated that “The warrants to purchase shares of Primo common stock will not be listed on the Nasdaq Global Market or any other exchange.” I’m however not sure if this also means that they won’t become tradable on the pink sheets. In the “simple calculation” I didn’t spent a lot of time on valuing the warrants, but I think that using the historical volatility of this year of 42% is probably a reasonable conservative guess. This year might have been a bit more volatility than normal thanks to the merger announcement, but on the other hand Primo Water will be more leveraged than today after the merger. The company will actually carry a big debt load, and having a highly leveraged company will be favorable for the value of the warrants since they will participate fully in the upside but the downside is limited. In addition to that I believe that the Black-Scholes equation tends to undervalue options that have a very long time before expiration remaining. I think the risk of this deal not closing is minimal. The deal is expected to close fast, before the end of this year, and insiders own 55.3% of the outstanding shares. They have already entered a voting agreement for 33.3% of the outstanding shares, and I guess the only reason that they haven’t entered a voting agreement for all their shares is some kind of legal one. But I think we can safely assume that the remaining 22.0% of their shares will also vote in agreement of the merger, and therefore insiders can approve the merger without requiring the consent of minority investors. I think the Glacier/Primo merger is a deal that makes sense for both parties. They want to get it done, and they will be able to do so. The big uncertainty is not in if this deal will happen, but what Glacier shareholders will exactly get. However, I don’t think that this uncertainty warrants a huge spread. This is a classic case where it’s in managements best interest to be a little bit conservative in the estimate of the final payout. If you estimate for example a $12.13/share cash component and it ends up a little bit higher no-one will complain, if you are overly optimistic and it ends up a lot lower you might get sued. In addition to this management will be incentivized to minimize transaction costs and not incur additional debt since they have the most to lose/gain since they own the majority of the outstanding stock. Of course, all the complexities, with among other things, the stock component that will remain in escrow and the warrants that have a vesting period and might not be tradable, makes this deal less attractive then if it would be a simply cash payment. If this deal would be a simple fixed cash payment with no strings attached I would say that a fair merger spread would be less than one percent. Accounting for the various uncertainties my guess would be that a five percent spread would be reasonable. It’s hard to pinpoint exactly, but I’m pretty sure that the current 17.3% spread is way too high and not even close to correct, and because of that I have made Glacier Water my largest position. This entry was posted in Portfolio and tagged GWSV, PRMW on October 28, 2016 by Alpha Vulture. As I explain below, hoarding cash is not an “improvement” in the cash position – our company is already overcapitalised, bloated with net cash far in excess of what is needed for the core business. Having too much equity drags down the rate of return on equity (profits divided by equity) and depresses the share price as it traps idle cash. The risk of burning the cash on unsuccessful new businesses beyond your area of expertise and excellence also depresses the share price, particularly given that Ming Fai has a proven track record of losing money in new non-core businesses. In over 25 years in the HK market, I have seen so many successful entrepreneurs list their business on the Stock Exchange and then make the mistake of assuming that they must be good at everything. Expertise in one field is not expertise in another. I hope you have learned from these mistakes, as that is what makes us all stronger. If you return surplus capital to the market, then the market will repay that trust. 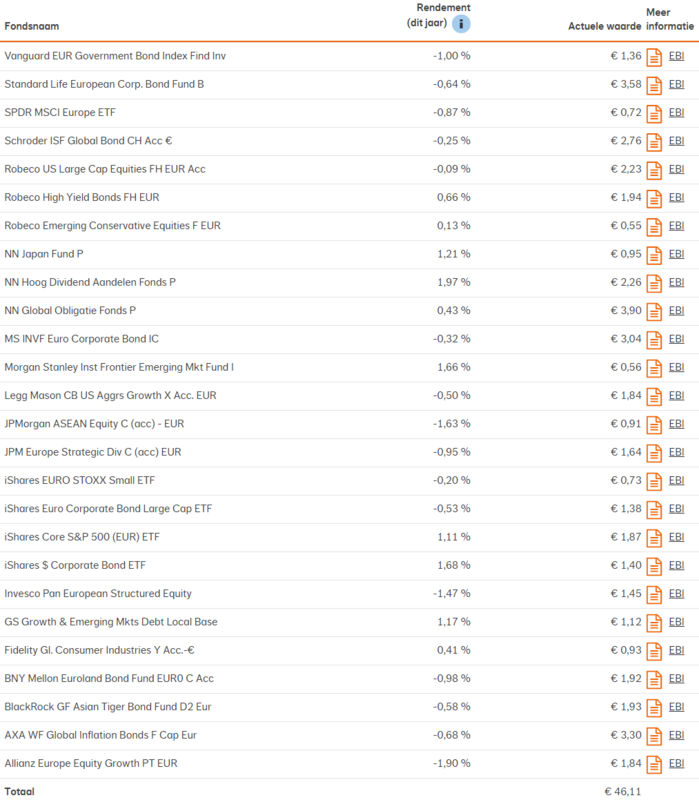 Just look at some of my other investees and you will see how this works. For example, Alco Holdings Ltd (0328), of which I own more than 9%, sold its former premises in Zung Fu Building on 29-Dec-2015 and has since then distributed a total of $0.90 per share in dividends. The stock has returned 68.2% since 29-Dec-2015 (the day of the announcement) when it was trading at $2.30, and closed yesterday at $2.90. This entry was posted in Portfolio and tagged 3828.HK on October 19, 2016 by Alpha Vulture. This entry was posted in General on October 15, 2016 by Alpha Vulture.